Street Fighter Alpha 3 is a sequel to Street Fighter Alpha 2 in story and spirit only. It is more of an evolution than the change from SFA1 to SFA2. 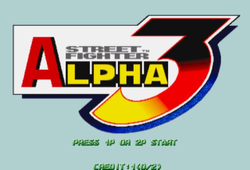 SFA3 retains the anime style and spirit of the Alpha series, but takes the core engine and mixes things up a little bit. When a player chooses a character from the SFA3 roster (the largest in the series), he must then also choose an "ISM", either X, A, or V. The ISM chosen determines which rules and abilities the character uses. This, in essence, triples your choices when selecting a character. X-ISM is a style of play that most closely resembles Super Street Fighter II Turbo (or SSF2 X as it was known in Japan). The A in A-ISM stands for Alpha, and is the core style used in the previous two Alpha games. And the V-ISM style represents the Variable (or Custom) Combo aspect of Alpha introduced in SFA2. Only V-ISM style characters can use Variable Combos, and as a trade off, they have no predetermined Super Moves. Not every move that a character knows is available to that character in every ISM. So it's important to reference the move lists below to determine which moves a character has access to in a given ISM. An X, A, or V next to the move indicates that the move is available in that ISM. In addition to these three ISMs, there are three hidden modes of play, Classic, Mazi, and Saikyou, which can be unlocked to provide more alternatives. In addition to these changes, the character selection has been greatly expanded over SFA2. Upgraded versions of SFA3 have continued to expand on that selection. SFA3 was ported somewhat successfully to the Sega Saturn and PlayStation consoles. The Saturn's use of an optional 4 Meg RAM cartridge helped its conversion out considerably, but the PlayStation's limited RAM prevented its port from being entirely accurrate. SFA3 made a tremendous splash on the newly arrived Sega Dreamcast where it saw a sizeable roster increase. This version was later ported back to the arcade in Japan as Street Fighter Zero 3 Upper. Several years later, a version appeared on the Game Boy Advance which included three new characters taken from Capcom vs. SNK 2. Although still entitled SFA3 outside of Japan, it was known as Street Fighter Zero 3 Upper in Japan. In 2006 SFA3 was upgraded once again, this time for the PlayStation Portable, where it introduced one new character, Ingrid from Capcom Fighting Evolution. This version was known as Street Fighter Zero 3 Double Upper in Japan, and Street Fighter Alpha 3 MAX outside of Japan. This page was last edited on 22 October 2013, at 17:19. This page has been accessed 186,115 times.